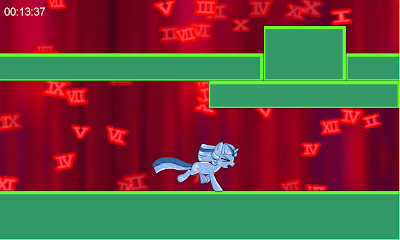 It's been awhile since veteran webcomic artist and fangame developer Mark Sprague has added to his well-received Pony Platforming Project series, and so far the results have always been worth the longish wait between installments. For April Fools day he decided to make a joke addition to the series, but it ended up being released a tad later and far more substantial than originally intended: in fact, I would say that it warrants a review of its own. You can find the full review after the break, of course. If there was no page break it would take far too long to browse the site, and at least we're not splitting up articles into multiple pages, eh? 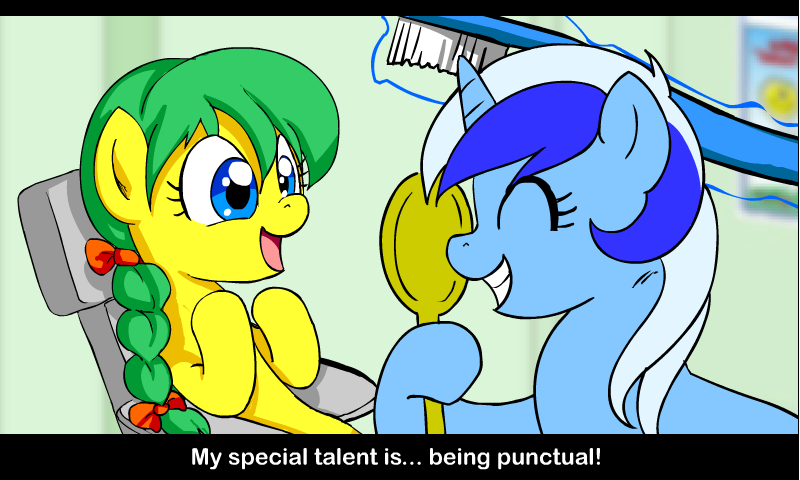 Given that Minuette vs Tardiness was intended to be an April Fools game, the plot is understandably quite strange. It stars the receptionist at Colgate's dental clinic, Minuette, who appears to have an obsession with arriving on time and whose worst nightmare is being late. Enter the Nightmare King, a demonic monster who traps ponies within their nightmares and likes to utterly break them before devouring their souls as a late-night snack. Pretty much he's your typical demon, except for the fact that he resembles a deformed elephant who dresses like a moron and has an epic moustache. Instead of devouring her on the spot like a smart monster would he forces the poor gal to complete a series of levels, each with a time limit. The game starts off in a fairly straightforward manner, but things quickly become rather hectic. Those who have played the previous games in the series should feel right at home, although this entry changes several things: the most important of which is a timer. As the timer gets closer and closer to 0:00 it grows larger and flashes in a threatening manner, and when a level timer runs out your soul gets devoured by Nightmareface. This along with Minuette's panicky animations have the effect of gradually giving the player the same dread of being tardy as the protagonist herself, and after a while it truly begins to feel like a nightmare. Certain levels also feature switches that rotate the level on its sides, wraparound edges and disappearing platforms to increase difficulty and make things even more hectic. Reaching the end of each level is an immense relief, and the game makes you work hard to get there. As with most of Sprague's games, visuals are a fairly strong point. The levels themselves do the job well enough but are nothing special, while the character animations and cutscenes are superb. Minuette in particular is quite well-done: subtle additions such as looking nervously around while standing still and crying while running help establish her character and convey a sense of urgency that would otherwise be lacking. As for the backgrounds...for the most part they are fairly simple and don't get in the way, but later on they can become rather impressive. Poor gal. You'd be running scared too if somebody invaded your dreams and tried eating your soul. Given that the game is mainly centered around speed it is understandable that the controls would reflect this, and sometimes the delay in coming to a complete stop can result in the player falling down one of many bottomless pits. The player is also required to stand still before they can pick up blocks or trigger switches, and while this quirk might take some getting used to I wouldn't really say that it is a flaw as it adds extra challenge. 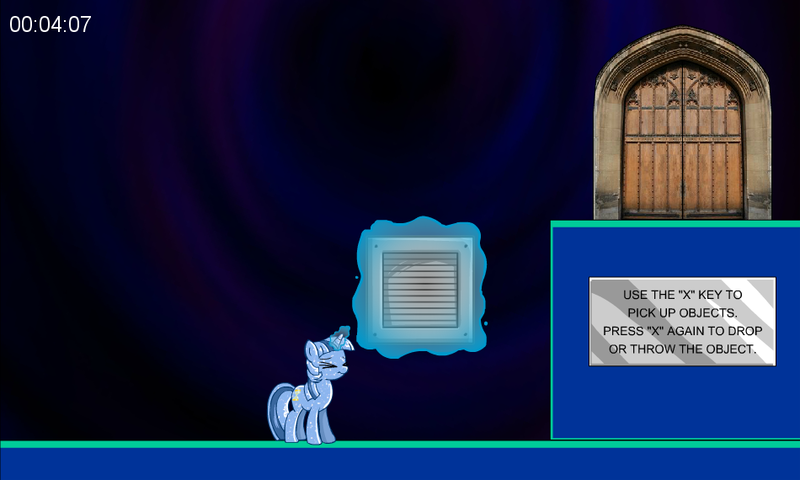 This is especially useful to know upon encountering the first switch in the game, as running into it may cause Minuette to disappear due to a glitch and leave the player utterly helpless until time runs out. Thankfully this only occurs once; the game is of a decent length and contains many switches. If it were any longer the lack of a save feature would be a problem...ah well, the game was only made in a day so I guess I can't expect that much from it. The cutscenes look pretty good, although this shouldn't be a surprise given that the creator is a webcomic artist. 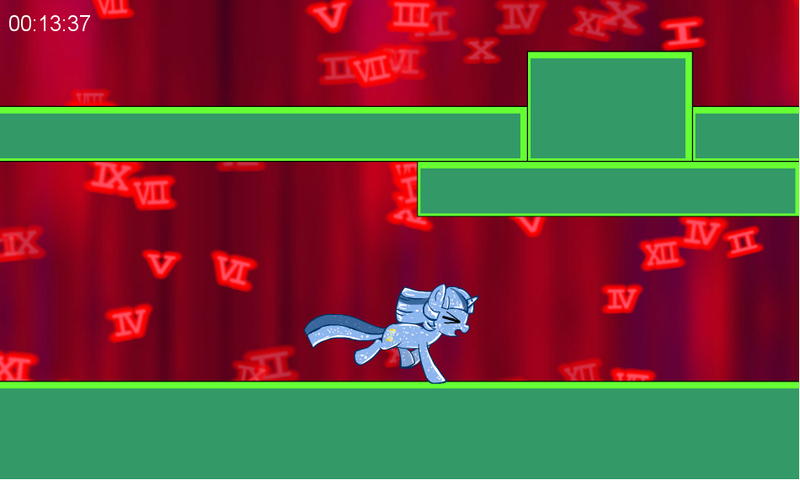 One thing that I really missed from the other three Pony Platforming Project games was the easter eggs. Many hidden secrets and whatnot were scattered across the games, but I was unable to find any in here other than a delicious cup of Tim Hortons coffee at the end (nice break from that abomination you Americans call Starbucks, and it even has delicious donuts to go along with your coffee!). Trixie's shop is also strangely absent from the game: then again, I guess Minuette has more important things to do than buy bottles of milk and magic horseshoes. Running for her life, for example. 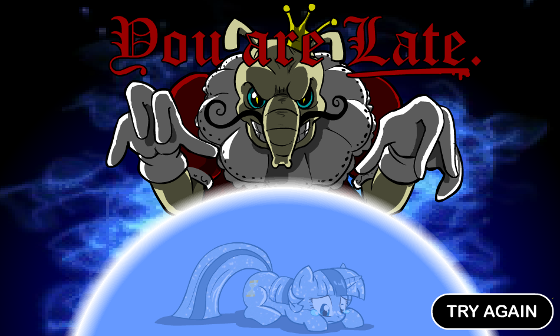 Does Minuette vs Tardiness live up to the first three entries of the Pony Platforming Project? That is hard to say, given that it is not really the same type of game. It's quite fun, sure, but unfortunately I don't think I can warrant giving it any more than an 8/10. At least we still have Minty Fresh Adventure II to look forward to, eh? I'm really looking forward to that game: from what I've seen it appears to be shaping up to be the best My Little Pony platformer yet. Shame it probably won't include any of this game's time-limited levels...a couple of those could really spice it up. Next up for review: Donitz (the man behind Story of the Blanks and Twilight vs Walking) brings us another creepypasta. I shan't say that much about it, other than that it involves a certain wall-eyed pegasus and a certain well-dressed faceless abomination. Cheerio!